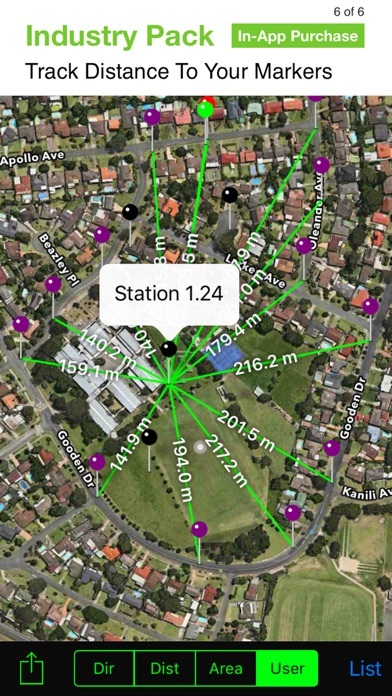 Solocator is a GPS camera for fieldwork. 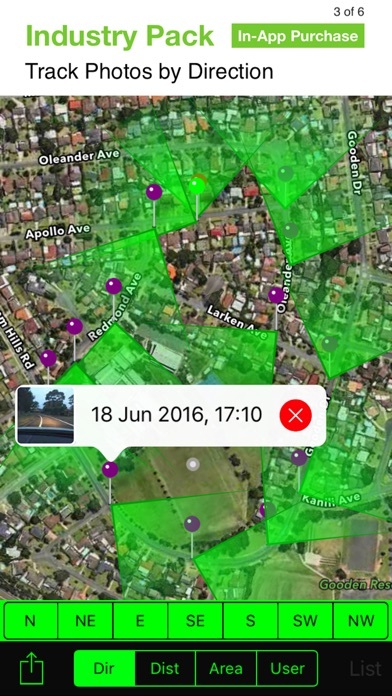 Overlay and stamp photos with GPS location, compass direction, altitude, date & time taken. Plus, with the Industry Pack (In-App Purchase) capture editable notes such as project name and photo description, street address and UTM/MGRS coordinate formats as well as customised exporting to Dropbox & Google Drive including KML, KMZ and CSV files. It can auto save two photos to camera roll at once - Stamped photo and original high res photo with back or front facing camera. You can also view photo direction and location in map view and navigate there. So now you will always know where and when a photo was taken and how to get back there. 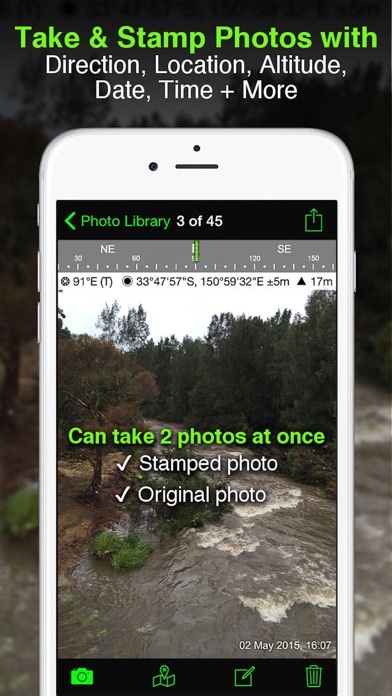 TAILOR THE INFO YOU NEED TO CAPTURE You can choose what information you want to overlay on your photos to suit your fieldwork. Choices include: - GPS Location (Latitude & Longitude in various formats) ± Accuracy - Compass direction – bearing - Altitude (Metric & Imperial units) - Date & time based on your GPS location - Show compass - Show Cardinal points in Building mode; e.g. north or south elevations of a building face. - Option to use abbreviations or Unicode characters for direction, position and altitude. WORKING WITH CAPTURED INFO - Options to take and auto save two photos to camera roll at once; one with stamped info and the other as an original high res photo. - Photos are sorted by time, location, distance from current location and by project name (if Industry Pack purchased). 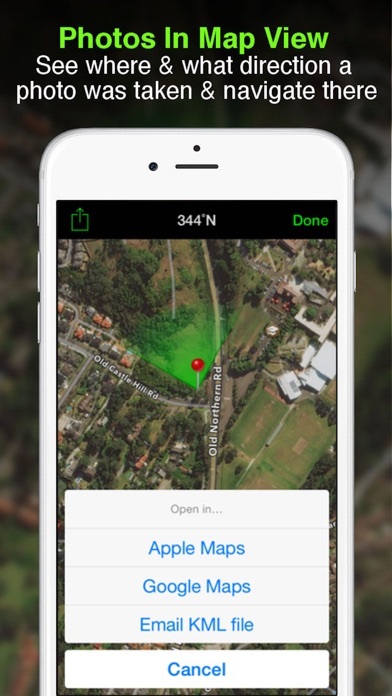 - View photo direction and location in map view and navigate there - Save photos with metadata in Exif format to camera roll - Share photos individually or as a zip file. - Email photos from within the app including: • Exif metadata • Compass direction • GPS Position ± accuracy • Altitude • Date & time taken • Street address (if selected) • Elevation of building face viewed (if selected) • Links to maps so receiver can navigate there easily INDUSTRY PACK (In-App Purchase) EDITABLE NOTES Stamp your photos with "Project name" & "Description". The project name field could be used as job or policy number. You can also go back and amend project name or description or just add the notes later when you’re in the office. PROJECT NAME USED AS FILE NAME PREFIX Photos taken with project name at the time of capture are saved with a prefix, which works with photos emailed. Photos with a project name will also be sorted and grouped by project name. Project names are also automatically used as email subject lines. YOUR WATERMARK Customize your photos by stamping your own watermark. e.g. company name, team or your name or copyright. STREET MODE Selecting street mode overlays photos with street address. You can select at what distance interval to check and update street address when on the go. CUSTOM EXPORT TO DROPBOX & GOOGLE DRIVE Export multiple photos with captured project file names to shared team folders. 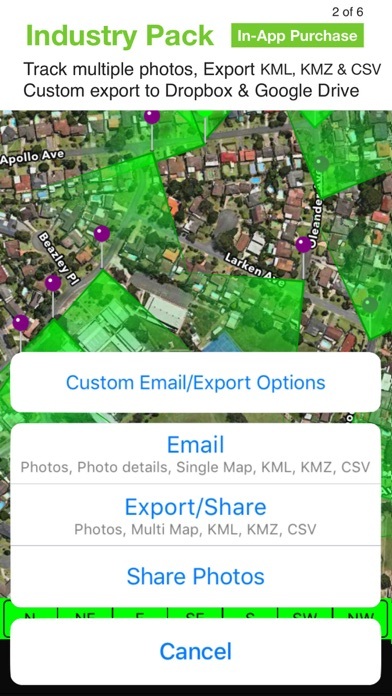 CUSTOM EXPORTING & EMAILING Export or email multiple photos and photo info in KML, KMZ or CSV formats. Attach maps of photo locations along with your photos when exporting or emailing. Select your combination of photos, maps and captured info in the file formats to suit your needs. Export/email photos individually or as a zip file. 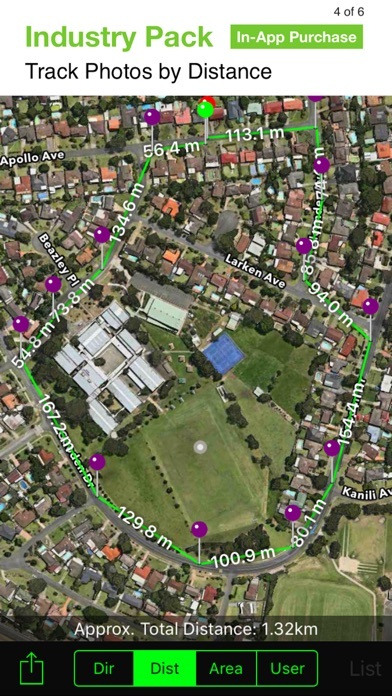 TRACK PHOTOS IN MAP VIEW View multiple photos by direction, distance between photos, area of photos taken and distance to your added markers via imported KML files or dropped pins. 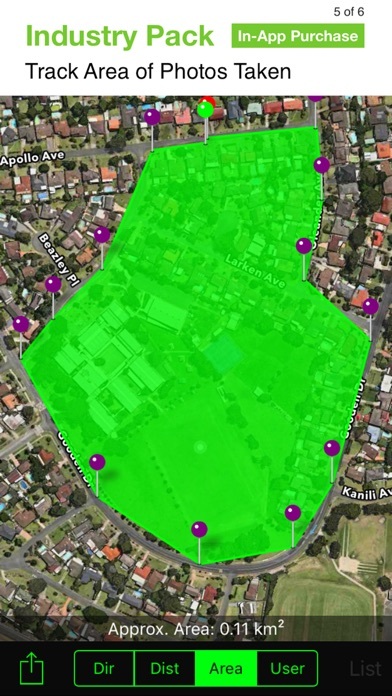 REFINE AND LOCK GPS LOCATION Ideal for those working in and around buildings; to improve your GPS location. You can also use it to lock the position of the asset or subject you’re photographing as opposed to where you’re standing. 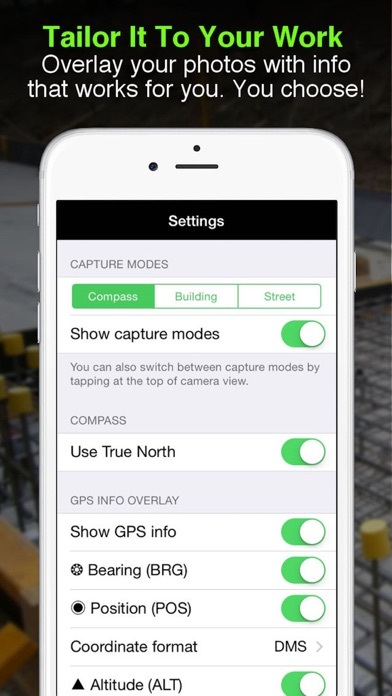 SWITCH OFF CAPTURE MODES – GREATER FLEXIBILITY Switch Compass, Building and Street modes off and just show GPS info bar on top of photos. 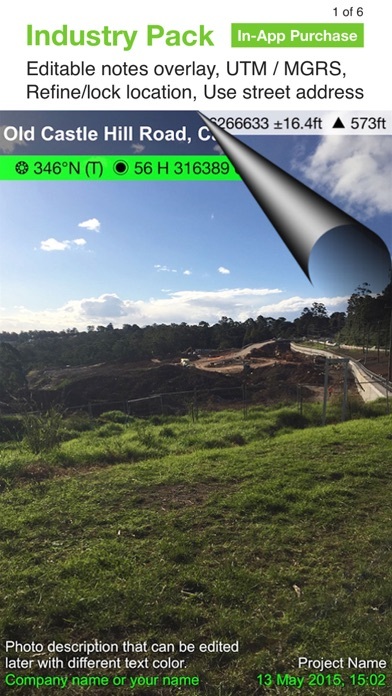 Gives you more flexibility on what and how you overlay info and show more of the photo. Can we embed the direction azimuth? I’d love to see a bearing added to exif. It would be useful in many applications. Thank you. Was better when the app consistently allowed use of the volume button to take photos. I take many, as I’m walking, in a short span of time. I prefer using the volume button opposed to the on screen button since I always seem to hit the flip camera button and switch it to the front facing without even noticing. Very nice little app. I highly recommend it. The app is great. For inspection and construction purposes it really helps. Stores memory in app even after you delete photos. Other than that it’s good! I have been using this app to document various aspects of my field work for a couple of years now. I show it to other folks that I think may benefit from using it as well; contractors, sub- contractors, utility locators, etc. Some one asked me if I received a commission if they purchase this App. I replied that the hours that this App saves me on a daily basis for my work is all the “commission” that I need. Thank you Solocator! When I can't get my digital camera to connect this is a great back up. Sometimes I have to log GPS position inspections. This works every time where my camera works 80 to 90%. Glad I found this app. If someone did not want to spend the extra money for the GPS camera, this is a great substitute. Love this app, has all the info I need right in the pictures,the only thing is, it makes the photos so big with my iPhone and iPad, my daily reports are huge, other Timestamp apps aren’t nearly as bad as this one... changing the photos to low quality doesn’t help either.. Waste of time app, as the images saved by this app are 1000 x 800 resolution (very low res/quality ~1MP), versus the standard iPhone 7 resolution of 4000 x 5000 (12MP+). Thus the images aren’t very useful, and there is no way to change the setting in the app. I’ve reached out to type developer 3 weeks ago, no response received. The 99 cents price is just a hook up. I paid .99 cents for what I thought was a full feature app. But If you want all the features you have to pay extra for it. Very deceiving!